Hamilton Grange National Memorial is a National Park Service site in St. Nicholas Park, New York City that preserves the relocated home of U.S. Founding Father Alexander Hamilton. Alexander Hamilton was born and raised in the West Indies and came to New York in 1772 at age 17 to study at King's College (now Columbia University). During his career, Hamilton was a military officer, lawyer, member of the United States Constitutional Convention, American political philosopher, initiator and author of the majority of the pivotal and influential The Federalist Papers, and the first United States Secretary of the Treasury. Drawing of the Grange before 1889. Hamilton commissioned architect John McComb Jr. to design a country home on Hamilton's 32 acres (13 ha) (0.13 km²) estate in upper Manhattan. The two-story frame Federal style house was completed in 1802, just two years before Hamilton's death resulting from his duel with Aaron Burr on July 11, 1804. The house was named "The Grange" after Hamilton's grandfather's estate in Scotland. The Grange was the only home ever owned by Hamilton and it remained in his family for 30 years after his death. The Hamilton Heights neighborhood of Harlem derived its name from Hamilton and the Grange. The previous (second) location of the home located on Convent Avenue. By 1889, much of the congregation of St. Luke's Episcopal Church in Greenwich Village had moved uptown. The Grange was in foreclosure and had been condemned for destruction in order to allow for the implementation of the Manhattan street grid, then just reaching that area of Harlem. The church acquired the house and moved it a half-block east and about two blocks south, conforming to the new street pattern, to what became 287 Convent Avenue. The original porches and other features were removed for the move. The staircase was removed and retrofitted to accommodate a makeshift entrance on the side of the house that faced the street, and the original grand federal style entrance was boarded up. St. Luke's used the house for services and subsequently erected a Richardsonian Romanesque building on the site between 1892 and 1895 that wrapped around the house slightly, thus when a six-story apartment building was built c. 1910 flush on the opposite side it was tightly enclosed and many of its features hidden. The American Scenic and Historic Preservation Society bought the Grange and turned it into a public museum in 1924. Furniture and decorative objects associated with the Hamilton family were displayed. The Grange was designated a National Historic Landmark in December 1960. 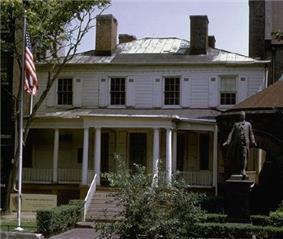 The private National Park Foundation purchased the house and property and transferred it to the National Park Service. Congress authorized the National Memorial on April 27, 1962, requiring that it be relocated and then the house restored to appear as Hamilton knew it in 1802–1804, which is considered its period of historic significance. It was at the time determined that the claustrophobic Convent Avenue setting was inappropriate and that the country house should be viewed as freestanding building. However, the house was not relocated earlier because of overwhelming local opposition to options offered that required moving it out of the neighborhood The Grange was administratively listed on the National Register of Historic Places on October 15, 1966. On May 9, 2006, The Hamilton Grange Memorial was closed to the public to allow for extensive architectural and structural investigations as part of a long term plan to move the house to nearby St. Nicholas Park. The park location was judged a more appropriate setting for display that would permit restoration of features lost in the 1889 move. The new location would also keep the house in the neighborhood and keep it on land that was within the boundary of Hamilton's original 32-acre (130,000 m2) estate. Hamilton Grange at St. Nicholas Park in October 2009. Work in St. Nicholas Park for tree removal and foundation construction began in February 2008. The actual move of the Grange began with elevation of the building in one piece over the loggia of St. Luke's Church and onto Convent Avenue. The Grange was placed on specially-built stilts that held the entire house approximately ten feet off the ground in the middle of Convent Avenue, between W. 141st and 142nd Street while traffic was routed around the house. The house completed its 500-foot journey on June 7, 2008 by being rolled one block south on Convent Avenue and then one block east on 141st Street (down a 6% grade) to the new St. Nicholas Park location. The six-hour event was a popular neighborhood attraction covered extensively in the press. The house was secured to its new foundation, original porches were rebuilt and the original main entrance doorway and main staircase within the entry foyer were restored. Landscaping around the Grange's new home includes among the tree plantings 13 sweet gum trees as were originally planted by Hamilton in honor of the original thirteen states, a stone wall, a circular garden planted in front to Hamilton's own specifications, and paths. The Grange has a security detail and possible video monitoring during the evening hours. The Grange re-opened to the general public on September 17, 2011. A ceremony was held with Hamilton descendants in attendance and tours of the restored interiors took place through the day. A visitors center is located in the entirely newly constructed ground floor, where the kitchen, laundry and servants' rooms would have been. 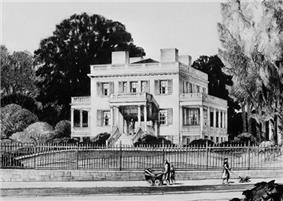 ^ a b "Hamilton Grange (Alexander Hamilton House)". National Historic Landmark summary listing. National Park Service. 2007-09-14. ^ , 27 March 2008New York SunFrancis Morrone, "Hamilton Heights To Lose Its Namesake?" Accessed 4 July 2008. ^ Dunlap, David W. (8 June 2008). "Witnessing a House, and History, on the Move". The New York Times. Retrieved 8 June 2008. ^ "NPS Timeline" (PDF). Retrieved 2012-05-07. ^ Hogarty, Dave (2008-06-08). "Moving This Old House". Gothamist. Retrieved 2012-05-07. ^ Dunlap, David W. (February 18, 2008). "Moving the Grange, and Twisting It Around, Too". The New York Times. ^ Repanshek, Kurt (May 30, 2008). 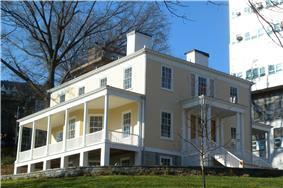 "Alexander Hamilton's "Country Home" on the Move in New York City". National Geographic Traveler. 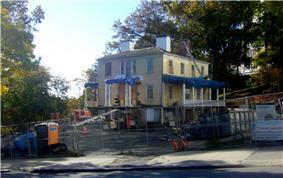 ^ "Alexander Hamilton Home Reopens After Complex Move". AOL Real Estate. 2011-09-19. Retrieved 2012-05-07. ^ Rothstein, Edward (September 15, 2011). "Museum Review Founder’s at Home". The New York Times.